His career was spoiled, however, by two severe knee injuries. He tore his right patellar tendon in April 1989, running into the outfield wall at Shea Stadium in New York. After coming back from that mishap, he tore his other patellar tendon in June 1990, catching his leg in the artificial turf at Philadelphia’s Veterans Stadium. He was out of the major leagues after 1991. Jones persevered in the minors, Mexico, Taiwan, independent leagues, and semi-pro ball through 2000. He then turned to coaching youth baseball in the Houston area, eventually becoming partners in an academy with his old teammate from Philadelphia, third baseman Charlie Hayes. With his genial and open personality, the hard-working Jones related well and drew praise as an instructor. Like his time in the majors, though, this man’s life was cut short. He died suddenly in 2006, aged only 41. Ronald Glen Jones was born on June 11, 1964. His birthplace, Seguin, is one of the oldest towns in Texas. It is the seat of Guadalupe County, adjoining San Antonio. His mother, Erna Jones, worked for poultry processor Holly Farms, one of Seguin’s biggest employers. As Jones himself said in 1988, Seguin is “mostly a football town.” Its most notable baseball player is Freddie Patek, the little shortstop whose major-league career ran from 1968 through 1981.5 Pitcher Chuck “Twiggy” Hartenstein (1965-70, 1977) is the other graduate of Seguin High School to play in the majors. Still, there was a distinct baseball scene in Seguin, and the family of Ron Jones was right in the middle of it. As many Seguin Gazette-Enterprise stories show, Flute Calvert was a pitcher of some note locally. The Pittsburgh Pirates signed him in March 1961, but Calvert never played in the minor leagues because the Pirates released him after several weeks of training camp.6 Instead, the righty hurled for various semi-pro teams in the 1960s and ’70s. He was on the same pitching staff with Hartenstein for the Seguin White Sox in 1960 and the SMI Steelers in 1961. Patek was a teammate with the Steelers in 1962 and 1963. Calvert’s job as truck driver for railroad maintenance crews meant that he traveled a lot and had to work on some weekends. Nonetheless, according to sister Lisa, “My dad took a lot of time with Ron in the backyard, in Little League, all the way up, ever since he was little.” Calvert noted, “He could throw pretty good when he was three or four years old.” 7 From that early age, Jones’s work ethic was visible. Another longtime member of the SMI Steelers was Ron’s uncle, Alvin “Boomer” Jones, who was born a little less than 10 years before his nephew. Boomer was a minor-league outfielder in the Atlanta Braves organization from 1973 through 1976, ultimately reaching Class A; he later scouted for the Braves. Ron’s cousin, Alvin Jones Jr., was a fourth-round draft pick of the Chicago White Sox in 2000 and pitched three years at the rookie-ball level (2000-02).8 Of interest, Ron Jones and his uncle both threw right-handed but batted lefty. Jones played baseball and football at Seguin High. He was a running back on the gridiron, and a good one. “Jones has the capability to turn second and third efforts into long touchdowns,” the Gazette-Enterprise wrote in December 1981 after he was named unanimously to the All-District team. “Great balance and deceptive speed combined with power made Jones the hardest runner to tackle in the district.”10 He was fast enough to be a sprinter on the track team. Jones went undrafted after his second year at WCJC, so he went back to Seguin and played again with the SMI Steelers.20 Finally, on October 20, 1984, the 20-year-old Jones turned professional. Scouts Doug Gassaway and Rudy Terrasas signed him as an undrafted free agent for the Phillies. Jones also won the Paul Owens Award, given to the organization’s top minor-leaguer.24 He continued his heavy hitting that winter in Mexico. With Mazatlán in the Mexican Pacific League, he matched his Clearwater average of .371; his 40 extra-base hits included 18 homers.25 The Venados (Deer) became league champions that season. Jones then returned to Mexican winter ball and continued to hit well.27 In February 1988, Phillies manager Lee Elia said that he wanted a long look at “the organization’s best young hitting prospect in years.”28 However, Jones started that season in Maine again. Jones played well in spurts for the Guides in 1988. His average was modest for him at .267, but he hit 16 homers and drove in 75 in 125 games, including a late surge of 27 in 27 games.30 His RBI total led the International League. 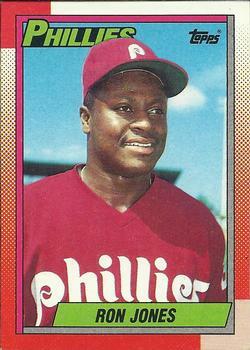 Indeed, for the Phillies in ’88, Jones hit .290-8-26 in 33 games. Lee Elia said, “Jonesy keeps putting his bat on the ball and making things happen.”34 His performance made him an early candidate for NL Rookie of the Year in 1989. During his first rehab, Jones had said, “I’ve learned I don’t want to go through this again.”57 Yet he wasn’t deterred – he worked so hard at his second comeback that he wore out an exercise bike at home. He said, “Maybe some people felt I’d give up. Well, they couldn’t have been more wrong.”58 He was back in action during camp in 1991 and went to extended spring training to continue his recovery. After that, he went on a rehab assignment in Clearwater and returned to Scranton/Wilkes-Barre. The Phillies recalled Jones in mid-June. He was with them for roughly a month but did nothing but pinch-hit. He went back to Triple-A on July 12.59 When the rosters expanded in September, Jones came back for his last 10 games in the majors. These, too, were all pinch-hitting appearances. For the season, he was 4-for-28. Following another winter in Mexico (this time with the Navojoa Mayos), Jones climbed back to Triple-A in 1993, getting a job in the Atlanta Braves chain. The results were better (.291-10-41 in 79 games for Richmond), but that was the last Jones played in the U.S. minor leagues. Independent leagues: Texas-Louisiana League (1994 and 2000 – Rio Grande Valley WhiteWings); Northern League (1998 – Thunder Bay Whiskey Jacks, 1999 – Sioux Falls Canaries). Mexican League: 1994 – Yucatán Leones, 1997 – Tabasco Olmecas, 1998 – Saltillo Saraperos, 1999 – Dos Laredos Tecolotes. He played 193 games in Mexico’s summer league. They were all short stints except for ’98 with Saltillo, when he hit .349 in 120 games. Overall, he batted .302 with 17 homers and 116 RBIs. Taiwan: 1995 – Jungo Bears, 1996 – Sinon Bulls. His totals in Taiwanese ball were a .285 average with 18 homers and 75 RBIs in 134 games. The salaries were rather attractive in Taiwan, although the shadow of gambling hung over the game there. On June 4, 2006 – just a week short of his 42nd birthday – Jones worked with a high school group while Hayes helped younger players. At the end of the day, Jones said, “Man, I don’t feel good. I’m tired. I’m just going to go home.” The next day, a Monday, Jones did not come to the academy. That was not immediate cause for alarm because he often took Mondays off. But when Jones did not turn up on either of the following two days, concern mounted, not least because Hayes’ son Tyree had been drafted and it was out of character for Jones not even to call. Hayes also had a notion that something bad might have happened because Jones was living in a tough part of Houston. Grateful acknowledgment for their input to Charlie Hayes and David Hamilton, as well as the family of Ron Jones: Lisa Crutcher (sister); Erna and Arthur Calvert (parents). Without the sequence of introductions, this story would not have been the same. Pedro Treto Cisneros, editor, Enciclopedia del Béisbol Mexicano (Mexico City: Revistas Deportivas, S.A. de C.V.: 11th edition, 2011). 1 Paul Hagen, “Phils About to Give Up on Jones,” Philadelphia Daily News, October 17, 1991. 2 Les Bowen, “Jones Must Fill Some Tiny Shoes,” Philadelphia Daily News, September 7, 1988. 3 Stan Isle, “Next Tony Gwynn?”, The Sporting News, August 4, 1986, 39. This report quoted the eminent scout Hugh Alexander, who was then player personnel adviser for the Phillies. 4 Telephone interview, Rory Costello with Lisa Crutcher, May 24, 2017 (hereafter Crutcher interview). 6 “Pirates Sign 3 for farm Clubs,” Pittsburgh Press, March 16, 1961, 47. Telephone interview, Erna and Arthur Calvert with Rory Costello, May 28, 2017 (hereafter Calvert interview). 7 Crutcher interview. Calvert interview. 8 Felicia Frazar, “Former ballplayer, Seguin resident honored,” Seguin Gazette, August 14, 2016. 9 E-mail, Charlie Hayes to Rory Costello, April 16, 2017 (hereafter Hayes e-mail). 10 John R. Corbett, “These Matadors deserved honors,” Seguin Gazette-Enterprise, December 16, 1981. 11 Telephone interview, Rory Costello with David Hamilton, April 19, 2017 (hereafter Hamilton interview). 12 John R. Corbett, “Mats ready ‘to go to war,’” Seguin Gazette-Enterprise, August 30, 1981. 13 “Alvin ‘Boomer’ Jones inducted posthumously to National Baseball Congress Hall of Fame,” SeguinToday.com, August 12, 2016. 14 “Sports Year-in-Review,” Seguin Gazette-Enterprise, December 28, 1982. “Bauer receives Zack L. Williams Memorial Award,” SeguinToday.com, May 24, 2016. 16 “Jays draft Ronald Jones,” Seguin Gazette-Enterprise, June 10, 1982, 2. 17 John R. Corbett, “’Boomer’ still swinging for SMI,” Seguin Gazette Enterprise, June 17, 1990, 4. 19 Kermit Westerholm, “Jones Aims for Big Leagues,” Seguin Gazette-Enterprise, July 1, 1986. 23 Beth Rhodes and Frank Carroll, “Jones Is Top Player in FSL,” Orlando Sentinel, August 21, 1986. 25 Bill Conlin, “Will Phils Open Pocketbook for Parrish?”, Philadelphia Daily News, January 10, 1987. 26 “Notebook: N.L. East – Phillies,” The Sporting News, December 14, 1987, 54. 27 “N.L. East – Phillies,” The Sporting News, January 18, 1988, 43. 28 Peter Pascarelli, “Giants Should Still Stand Tall in the West,” The Sporting News, February 15, 1988, 36. 29 Chad Finn, “Three random 1989 Donruss baseball cards,” Touching All the Bases blog, June 24, 2006. 30 “Around the Minors,” The Sporting News, July 25, 1988, 37. “Around the Minors,” The Sporting News, September 5, 1988, 39. 31 “N.L. East – Phillies,” The Sporting News, September 5, 1988, 21. 32 “Jones homers for Phillies in first major league game,” Seguin Gazette-Enterprise, August 28, 1988, 5. As of Opening Day 2017, just six players have had two homers in their big-league debut: Charlie Reilly (1889), Bob Nieman (1951), Bert Campaneris (1964), Mark Quinn (1999), J.P. Arencibia (2010), and Trevor Story (2016). 34 Bill Brown, “Sudden Power Surge,” The Sporting News, October 3, 1988, 20. 35 “Notebook: N.L. East – Phillies,” The Sporting News, December 12, 1988, 52. This article did not mention the team. A Puerto Rican baseball card showed Jones in Mayagüez uniform. 37 “Phillies 7, Mets 1,” United Press International, April 18, 1989. 38 “Random Past Phillie: Ron Jones,” Drunk Phils Fans blog, February 21, 2010. As an aside, in his novel Rabbit at Rest, John Updike refers to this game. Mike Schmidt’s 546th career home run is mentioned – but with the Phillies up 5-0, Rabbit Angstrom switches channels and then turns off his TV before the Jones injury takes place. 39 “A Case of Bite Being as Bad as Barkley,” Los Angeles Times, April 21, 1989. 40 Frank Dolson, “Cincinnati to Pad Walls in Outfield,” Philadelphia Inquirer, August 30, 1991. 41 “Daniels Injured,” Orlando Sentinel, April 22, 1989. 42 Les Bowen, “Jones Likely to Resume Playing Next Week in Triple A,” Philadelphia Daily News, August 18, 1989. 43 “Local Sports Briefs,” Seguin Enterprise-Gazette, September 7, 1989. 44 Dave Caldwell, “For Ron Jones, No Shortcuts on the Road to Recovery,” Philadelphia Inquirer, May 11, 1990. 45 Paul Hagen, “Phils Make Room for Jones, Vatcher,” Philadelphia Daily News, May 29, 1990. 46 Sam Carchidi, “Question Facing Ron Jones: Will He Ever Play Again?”, Philadelphia Inquirer, July 2, 1990. 48 Sam Carchidi, “Phils Lose Ron Jones for the Season,” Philadelphia Inquirer, July 1, 1990. 49 Don Bostrom, “Lightning Hits Jones 2nd Time,” The Morning Call (Allentown, Pennsylvania), July 2, 1990. The turf at the Vet had been replaced about a year before but was damaged during a Rolling Stones concert in September 1989 when a fan sliced it with a knife. It was repaired after the Philadelphia Eagles of the NFL finished their season. 50 An even more extreme example came at Veterans Stadium in October 1993, when Chicago Bears wide receiver Wendell Davis severed both patellar tendons after planting his feet while preparing to jump for a ball. See Peter King, “A Fight over Turf,” Sports Illustrated, November 1, 1993. 51 Paul Hagen, “Doc Expects Jones Back, but Thomas Isn’t Sure,” Philadelphia Daily News. 53 “Phillies’ Jones Has Surgery, Out for Season,” Associated Press, July 2, 1990. 54 “Dykstra Thanks Fans for All-Star Berth,” The Sporting News, July 16, 1990, 8. 58 Paul Hagen, “Into Swing of Things after Another Rehab,” Philadelphia Daily News, March 7, 1991. 59 “Transactions,” Baltimore Sun, July 12, 1991. 61 “Captains: Moving players part of development system,” Shreveport Times, August 17, 1992, 16. 62 Crutcher interview. Calvert interview. 63 “Local Sports Briefs,” Seguin Gazette-Enterprise, June 12, 1994. “SMI begins tournament with big offensive show,” Seguin Gazette-Enterprise, July 17, 1997. 66 Dom Sylvester, post in thread titled “Ron Jones Dead at 42 [sic],” MLB.com forums / Philadelphia Phillies, July 4, 2006. 67 Doug Sarant, “Good instructors produce good baseball players,” Houston Chronicle, June 23, 2004. 68 Paul Hagen, “Hayes fond of Philly, friendship with Jones,” MLB.com, August 28, 2015. 69 Allen Jones, “Big League Baseball Academy partner, Ron Jones, dead at 42 [sic],” Houston Chronicle, June 20, 2006. 71 Crutcher interview. The press release that the Phillies issued said simply “natural causes.” See “Ron Jones, former Phillies outfielder, dies,” MLB.com, June 12, 2006. 72 His simple marker, which features a bat and ball, gives his date of death as June 5. 73 Ibid. Tommy Keeler Jr., “Hayes enjoys time working with Express,” The Northern Virginia Daily, June 24, 2015.